Mr Rooter Tip Of The Day: A disposal usually has two inputs (bowl and dishwasher) and one drain output. Usually the AC input is on the bottom. You can slide the locking ring part-way up the ramp by hand, but you need an anti-jamb wrench to get it seated all the way. “Homeowners can install a disposal under either strainer in a kitchen sink, but the common location is on the strainer opposite the drainpipe entry,” says Bob Beall, the most referred and trusted Pittsburgh plumber. Disposals, according to Beall, will need a dedicated switched 120v outlet under the sink – not a line tapped into the kitchen counter receptacles. “It is best if the disposal has its own branch circuit, but if another circuit is readily available (not the counter circuit) you could tap into it,” says Mr Rooter. Expert plumbing advice is offered daily through Mr Rooter Tip Of The Day, available to over 2.9 million customers in the Northeast Ohio and Southwest Pennsylvania region. Before starting the installation, plan the switch location. “The switch can be installed in the wall above the counter, an option that means cutting into the walls. An easier alternative is to get a disposal with the switch built into the lid. An even better choice is a disposal with an air switch,” according to Beall, master plumber and owner of the family run Mr Rooter franchise in Pittsburgh and Youngstown. “A homeowner can mount the switch on the sink (like a push button) and it does not require running new electric lines.” Installing the disposal unit can be accomplished by following these easy tips. Tip #1 Locate all the parts for the disposal locking mechanism that fastens to the strainer if it’s present on an existing sink, and clean the lip where the strainer was mounted. Tip #2 Caulk the strainer-hole flange and slip in the disposal’s sink flange, orienting any lettering or logo as you wish. Tip #3 Holding the flange in place from above, slip on the triangular bracket and gasket. Tip #4 The round mounting bracket with three bolts goes on next, but you have to back off the three bolts (don’t remove them completely) before you slip it on. Fit this unit on and slip on the snap ring clamp. Tighten the three threaded bolts with a screwdriver. Tip #5 Lift the disposal into place under the bowl and twist the locking ring to secure it. Tip #6 Make sure all three tabs engage the locking ring. All three sides have to slide up a flat metal arm. Tip #7 Lift the disposal up to the bracket and turn the disposal’s mounting ring to lock in place. Optional drain input for dishwasher. Pop out the plastic seal inside with a screwdriver if used for a dishwasher. Drain output from disposal. Take to drain before P-trap. Using supplied pipe is optional but drain must go downhill. AC on bottom (not seen). WHAT CAN GO WRONG: When locking the disposal in place, the locking ring must slide up a fixed metal ramp. You can slide the locking ring part-way up the ramp by hand, but you need an anti-jamb wrench to get it seated all the way. 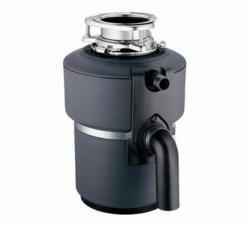 The disposal is designed with three slots for the wrench 120 degrees apart. Typically, if you insert the wrench in one slot and pull it, the entire ring will slide the last half inch to the locked position. Beall ‘s goal is to provide affordable costs to homeowners for any of the services they may need, many of which might occur unexpectedly. Mr Rooter coupons help to achieve this goal, as well as expert plumbing advice offered daily to homeowners. Mr Rooter prides itself on excellent customer service. Fast, courteous and front line services is what you should expect. We guarantee that is what you will get and our customers know the price before we start. Sign up for Mr Rooter Tip Of The Day and you will automatically be registered for our drawing for FREE Steeler Tickets. Next game: Steelers vs Baltimore Ravens, November 18th, @ Heinz Field. Sign up now!